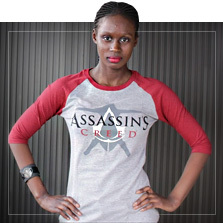 If you are a video game expert and you have been through them all, if you have to give a gift to a gamer and you don't know where to start... Our selection of video game T-Shirts is perfect for you. 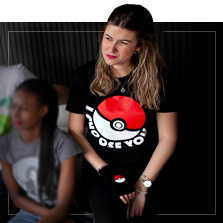 We have all the most exclusive shirts for gamers with the most popular characters and quotes from the latest video games and also the most classic shirts such as Pac-Man, Mario Bros, Zelda, Pokemon T-Shirts or Assassin's Creed. It doesn't matter if you like PlayStation, Game Boy or Nintendo... or if you are really nostalgic and for you there has never been anything better than Commodore 64. 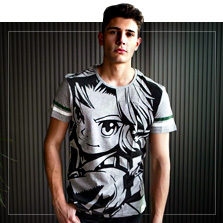 If you are a true gamer you will go crazy for the shirts and merchandise we have at Funidelia. The best ideas and gifts for gamers! 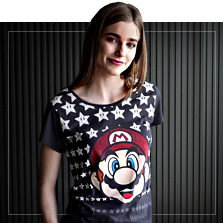 Includes: black T-Shirt with Pac Man pattern on the chest. 100% cotton. Includes: T-Shirt made of 100 % cotton with "There's always a man, Always a lighthouse, always a city." design.